For ages 9 - 12. 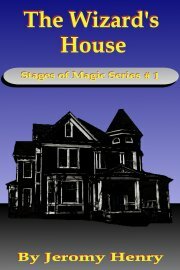 A visit to an abandoned house catapults Sam and Angela into magic, mystery and danger. Can they escape a duel between rival magicians? Can they use their wits and courage to find their way home? Will their lives ever be the same again? Find out in the debut volume of this exciting new series. Sam inched away from her. When his older sister grew bored, she caused trouble. And she always dragged Sam into a mess with her. "We could go to the pool," he suggested. "It's not open for two more days. They're fixing the water slide," said Angela. "Besides, who wants to go to the dumb ol' pool anyway?" Sam could hear the longing in her voice and knew she really wanted to go. He wished she'd run off with some of her girlfriends and leave him alone. Maybe he could finish his Lego tower or read the latest stack of books from the library. Even under the shade of their deck, he felt like a half-melted ice cream cone. And that gave him an idea. "We could get some ice cream," he suggested hopefully. Angela ignored him and started to twirl strands of her fire-red, shoulder length hair around one finger. Her green eyes narrowed. She thumped on the porch step with her heels. At these signs of danger, Sam prepared to leap to his feet and make a run for it, but one of her hands snaked out and grabbed his arm. "Let's go next door!" she said. Sam looked dubiously at the house to their left. Dust covered the windows. Grass grew up to his knees all over the lawn. In one corner of the house loomed a crooked tower with a pointed top. "We can't go in there!" he protested. "It's dangerous. The floor will cave in. Or maybe wild animals live there." His sister dragged him down the steps and through the yard anyway. I can't wait until I get bigger than her, Sam thought. "We're just looking," said Angela. She peered into a window. Sam scanned the ranch houses nearby instead, looking for faces in the windows. Luckily, a tangle of trees at the back and the far side of the yard blocked the view of most of the neighbors. "Alright, you've had a look. Let's go," said Sam. "It's too dark and dusty," said Angela. "Let's try the back door." Sam sighed and let her lead him up the creaking steps and onto the creaking porch. He nervously looked at the bare boards beneath his feet, but he didn't see any rotten or broken wood. Even if mom grounded them, at least he wouldn't have to worry about a broken leg too, he thought. Angela marched up to the white door and wiped at the glass with the hem of her t-shirt. She looked for a minute and then rattled the rusty doorknob. A flash of yellow light dazzled Sam's eyes. The door swung open with a groan, like a monster waking up and yawning. The sound echoed through the inside of the house. "What was that flash? Static?" asked Sam. Angela sucked on her finger. "Or a booby trap. Maybe a spy lived here. Good thing the trap malfunctioned. Let's go in!" She smiled and laughed her best maniacal villain laugh. "That's breaking and entering! We'll get in big trouble!" hissed Sam. "And not so loud!" Angela waved her arm dismissively. "No one will see us. And it's not breaking and entering. The door was unlocked." "Or booby trapped," muttered Sam. Angela sniffed. "Obviously the owner doesn't care if we go inside. It's probably empty, anyway. I've never seen anyone come in here, and we've lived here two whole years. Have you?" "It's our duty to investigate. Come on!" said Angela, in her best British accent. Sam rolled his eyes at her playacting. He doubted a spy lived here. Probably some old lady had gone to a nursing home and left her house empty. They passed through an kitchen. Angela hummed as she yanked open the dirty white cupboards above and below the counters. They revealed stacks of plates and cups, and pots and pans. The oven door screeched as she opened it. "Why are you opening the oven?" asked Sam, holding his ears and wincing. "Sometimes spies hide things in funny places," said Angela imperiously. "Let the master detective work." "Dumb place to hide anything. What if someone accidentally baked it?" muttered Sam. Angela tried the lower cabinets. "Nothing. Let's go," she said. Once again the Claw of Death latched on to Sam's wrist. Angela turned a rusty iron knob and opened another door. Sam pushed a mental image of flashing police car lights and he and his sister in cuffs to one side and tried to calm down and enjoy the adventure. It wasn't like he had much choice. He could always argue he was here under duress, right? In the next room, cabinets with little drawers covered most of the walls. Empty bottles filled two slate-topped tables, like the ones in the science lab in school. Small bowls filled with pestles and colored powders sat here and there on tables and cabinets. He saw feathers, twigs, birds' eggs, and all sorts of other strange junk. An open doorway led to a gloomy, dark hall. He could see several doors down the hall. All of them were white, with the same funny, old-fashioned iron knobs. But what really caught his attention was the bottle full of glowing, purple liquid on one of the tables. It lit up the room, certainly more that the dim yellow-grey glow coming from the closed and dusty blinds. She picked up the bottle. "That's not a good idea," said Sam, backing up. "What if it's radioactive?" "Then it's too late for us already. Maybe we're already turning into mutants," said Angela. She let go of his hand and twisted off the glass top. Purple mist oozed out of the bottle. A gust of wind came from nowhere and blew the mist all over Sam. His ears grew to the size of elephant ears!